No Clue Crossword is the one in which no clue has been given. It is also also Clueless Crossword. In this crossword some of the alphabets are given in the grid and once you select a cell in the grid, all the cells which contains same letter as the cell one has selected gets highlighted and then you can think of the letter which will come in that particular selected cell. Due to dynamic nature of No Clue Crossword puzzle type it can be played only online. One will not see any offline version of this Crossword. 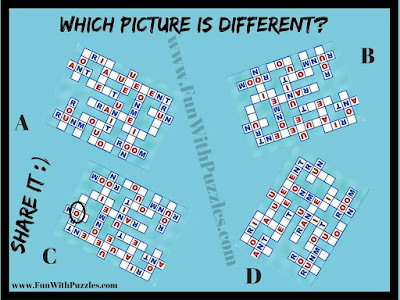 Today's puzzle is Odd one Out Picture Puzzle in which picture from the No Clue Crossword is taken. Your task is to find the Odd Picture Out. In this Odd One Out Picture Puzzle, there are four No Clue Crossword pictures. Three pictures out of these given four pictures are exactly same and only one picture is having little difference as compared to other picture image. Your challenge is to look carefully all the four picture images and find out which picture is different from other three pictures. 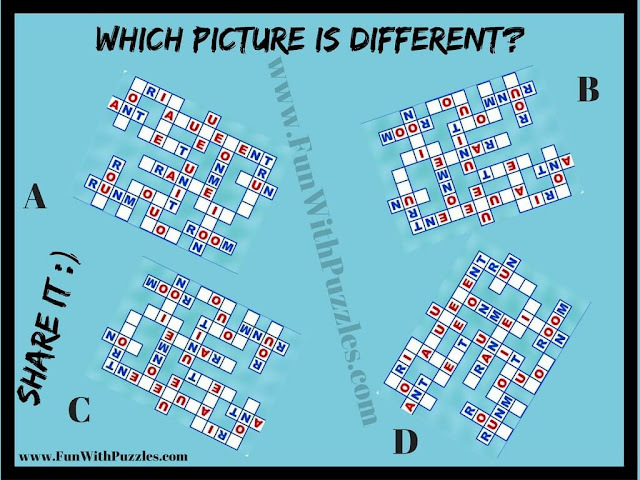 Which picture is different from other three pictures? Do check out more puzzles which will give twist to your brain and hence help you to improve your mind power. 1.Simple Fun Brain Teasers for kids with Answers: These are the fun puzzles creating by kids and for the kids. Some of these puzzles kids will be able to solve easily but it will take longer time for teens and adults to solve these puzzles. 2. Observational Skill Test-How Many Triangles Counting Brain Teasers: These are the observational skill test to check your visual ability. In these puzzles you are given the picture in which triangles are given and you have to count the number of triangles in pictures. 3. Fun Picture Puzzles to Test Your Observation Skills: Some more Observational puzzles in which there are photographs. In these photos some animals are hidden. You have to find these hidden animals in these photo puzzles.